Pioneered by Dr. Karimi, Cognitive Chemistry® as an extension to biochemistry, is the study of cognitive chemical processes such as self-assembly and self-organization within and relating to living organisms and applicable to other synthetic matter. With this special form of chemistry the system is able to recognize and respond to the dynamic environmental signals and even get adapted to its environmental conditions. The system is highly connected with its environmental factors through molecular sensors and logic gates. 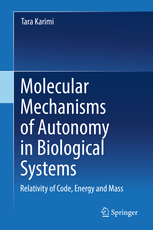 The system is made of a cluster of precisely coded molecules that through their electrochemical interactions are highly connected to each other as well as their environmental factors. In fact, a Cognitive Chemistry® system has the capacity of endogenous cognition.